BiNet USA salutes, celebrates, applauds and sends gigantic cheers to our brothers, sisters and non binary siblings across the pond as they celebrate a historic achievement! Jen Yockney MBE, veteran bi trans and nonbinary rock star, was acknowledged on Thursday, October 27th, 2016, at Buckingham Palace as part of the Queen's Birthday Honours List. Bi trans and nonbinary organizer Jen Yockney (in purple suit) with after ceremony at Buckingham Palace. 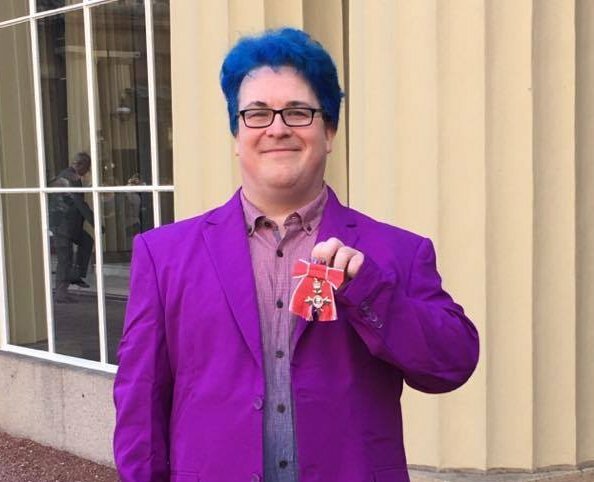 Yockney, founder of bivisibilityday.com and a key organizer in the global fight for bi, pan, fluid, queer (bi+) rights, was acknowledged specifically for "Services To The Bisexual Community" marking the first time in history a bisexual person has been acknowledged for their service to bisexual communities by the Queen of England. "In the structure of the presentation you bow or curtsey, go forward to receive your honour and brief talk, walk backward, curtsey or bow again and move on. To blend things as best as I can, I curtsey at the start and bow at the end. Again: no flicker of judgement or what have you, just the same warm congratulation from the team keeping the wheels turning as they give every other recipient. The monarchy is ancient, the honour I'm receiving some hundred years old, but the people making the wheels turn are thoroughly modern." 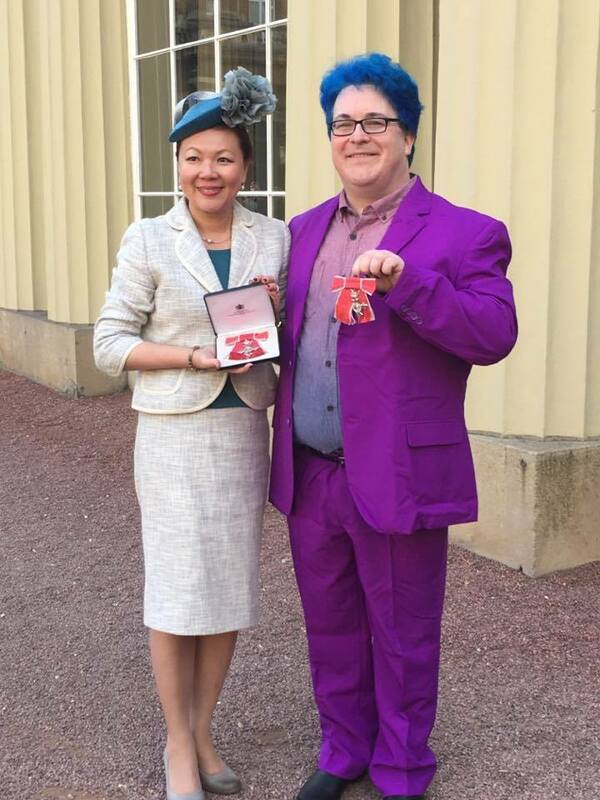 - Jen Yockney MBE, "The Big Day Out"
Bi trans and nonbinary organizer Jen Yockney MBE (in purple suit) with Merlene Toh Emerson MBE, who was acknowledged for "political and public service" in Chinese, Asian and SE Asian communities, and Honours awardee after ceremony at Buckingham Palace. Photo Credit: Jen Yockney MBE. I'm not wild about either the monarchy as a system or the empire as, well, my heritage is not very empire. But the bottom line for me is: this is the current Head of State of the country I choose to live in, and this is the system that same country uses for recognising the work in the community of its citizens. It is both an Honour and actually an honour, and a world away from the world I grew up in that such a symbol of the establishment is recognising someone genderqueer championing bi people's liberty and equality. - Jen Yockney MBE, "The Big Day Out"
BiNet USA sends massive congrats to Jen Yockney MBE on this recognition of their many years of service. Happy Intersex and Asexual Awareness Weeks!